The popular meme “Hide The Pain Harold,” is a nickname given to a senior stock photography model whose facial expression appears to indicate suppressed pain and/or discomfort. 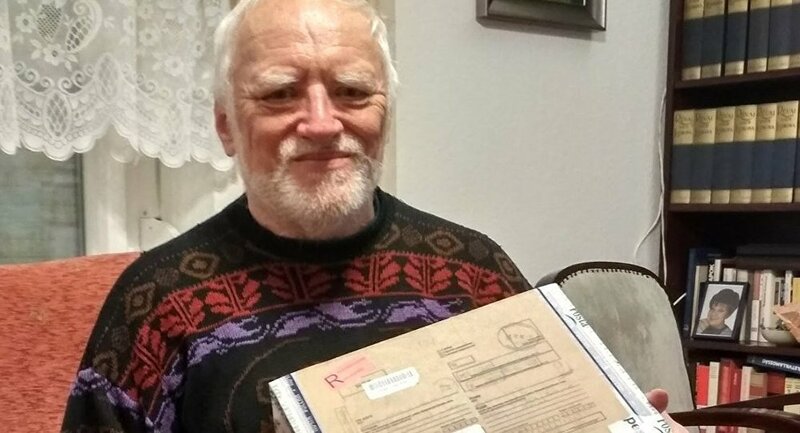 Russian residents of the city Perm sent gifts to Andras Arato, the model of a popular meme called "Hide the Pain Harold." The earliest known archived thread, where Harold first got attention, can be found on Facepunch, dating back to 2011. Harold is actually the Hungarian-born man Andras Arato, who became famous due to his smile, which people saw as his humble attempt to suppress pain. On October 23rd, 2011, a Facebook page for “Hide the Pain Harold was created.” Another Facebook page was created on January 1, 2014 and was titled “Maurice” (his nickname), it has over 10, 000 likes. In February 2018, the famous Arato starred in the video of the rock band Cloud 9+ for the song Hide the Pain. In the video, Arato impersonated his famous character and did not leave the image. The elderly Hungarian played an office worker, whose tyrant boss constantly harassed him. Recently, the residents of Perm sent Arato presents. Judging by the published photos, he received several chocolate bars, honey and a scarf in the Permian parcel, according to “Perm Active” on VKontakte. Arato expressed gratitude for the presents from his fans.